Please don’t sleep in your car in Yellowstone. You have better options! 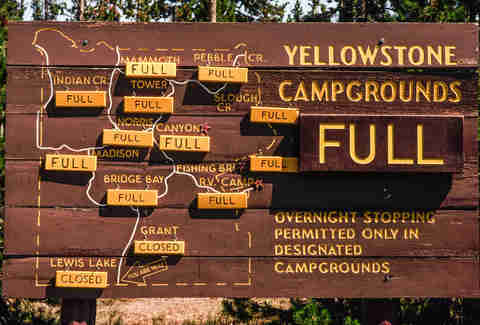 Yellowstone has a grand total of 2,178 camping sites spread across 12 campgrounds, seven of which are run by the National Park Service and are first come, first served. The other five are run by a private concessionaire called Yellowstone National Park Lodges -- these require reservations and are a bit more pricey. Visits to all campgrounds are limited to 14 days from July 1 through Labor Day, and 30 days the rest of the year -- with the exception of Fishing Bridge, where I guess you could just live out your remaining days in an RV if you wished. 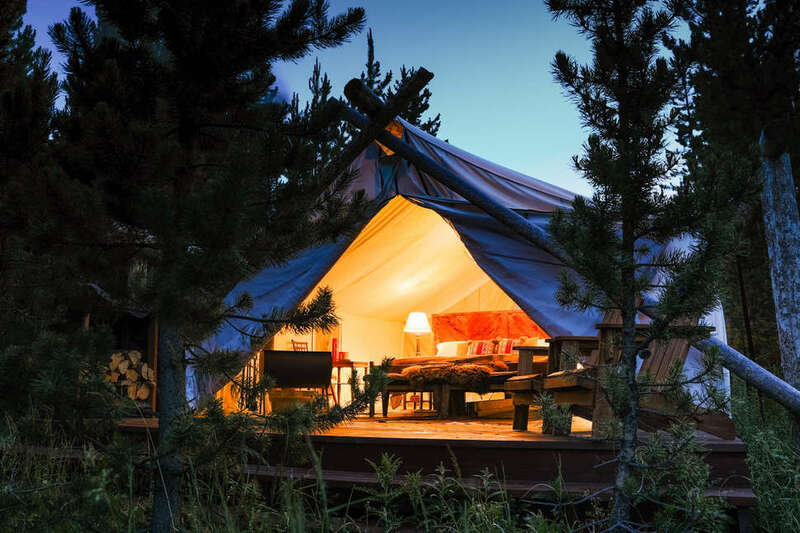 You also have options for backcountry camping in Yellowstone -- meaning you’re sleeping in the park’s undeveloped wild, carrying everything you need with you -- and glamping, meaning the opposite of that, plus private chefs and massages. NPS campgrounds are first come, first served, so show up early to secure a spot. The grounds open at 7am during peak season (generally June through August) and 8am at other times of year. You can check seasonal opening dates and daily availability here. All of these campgrounds are dry, which in this case doesn’t mean you can’t drink, but rather that you need to provide your own water. You’ll find picnic tables and fire grates, plus communal, bear-proof storage boxes for food. Campfires? They’re also allowed, but just in the designated areas you’ll find sprinkled around. Don’t, like, make your own. This is the only campground in Yellowstone that’s open year-round. Mammoth is in the northernmost part of the park, which tends to stay drier than the rest -- you’ll find all kinds of wildlife making mini-migrations up here come wintertime. This is also a good site for bigger RVs. In addition to being pretty scenic in its own right, this campground is minutes from the iconic Mammoth Hot Springs, plus the visitor center. On the other side of the park’s northern border lies the small town of Gardiner, Montana, where you can grab dinner and drinks, and actual cell service. Also, don’t underestimate the value of the flushing toilets, which are not a given at NPS campgrounds. More flushing toilets! Don’t get used to it. The Norris Geyser Basin is the hottest and most visibly dynamic region of the park -- geyser-wise -- and is also pretty central, so this is a good home base for an activity-packed visit. 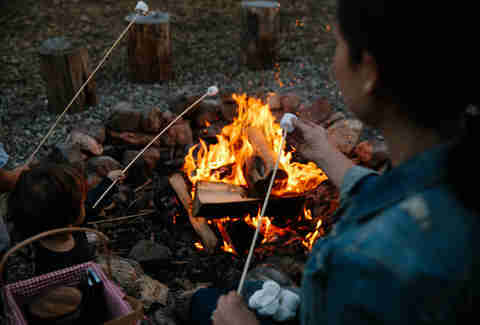 From June through September, you’ll find ranger-led evening campfire programs, too. Welcome to vault toilet territory. Nah don’t worry, they’re not really that bad -- they look more or less like the enclosed, covered campground toilets you’re used to, they just don’t have running water. Still better than an outhouse or, y’know, a hole you dig in the ground. Tower campground is right near the 130-foot Tower Falls, and is also one of the best places to stay if you’re serious about checking out the Lamar Valley. Indian Creek is more problematic in name than the rest, but, for what it’s worth, also more scenic than many of the others. It’s peaceful and bucolic, with a flat gurgling stream and gentle waving grasses, all set off by a spectacular view of the daunting Electric Peak. There’s no visitor center here -- hence it being comparatively quiet -- but Mammoth is just a few minutes’ drive up the road, and there are still summertime ranger-led programs. Another good option for those of you with longer RVs. Pebble Creek is more isolated than most of the other campgrounds, but that’s a good thing. It gives you the best access to the Lamar Valley, one of the most wildlife-stuffed and beautiful areas anywhere in the park. Hike into the valley when you want to truly avoid human contact, drive a few miles to the northeast entrance to check out Cooke City when you want it back. 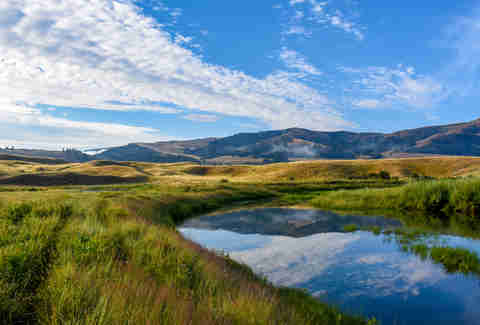 Not far from Pebble Creek, Slough Creek has all that same Lamar Valley goodness, but with the additional perks of great fishing and -- some years -- a wolf den. Your chances of hearing a pack howl at night are pretty good, from your tent pitched either in the meadow or among the trees. Lewis Lake is one of the boating spots favored by those in the know, and the channel between here and Shoshone Lake is the only river anywhere in the park that’s open to canoes and kayaks. Great fishing, too. These private contractor campgrounds are reservable, and generally have amenities like showers -- but the tradeoff is that they’re more expensive and more crowded. Note: Rates for these campgrounds don’t include taxes and utilities, which will vary depending on individual stuff like water usage. The Madison River is stupid pretty, and this campground is a favorite for fishing. Being a bit woodsier than some others, it’s also a particularly good one for spotting wildlife. Madison is one of only three campgrounds where you can reserve tents in groups (up to six people) so keep it in mind if you’re traveling with a pack. There’s a dump station here as well. Fishing Bridge is unique in that it’s RV-only -- no tent camping. There’s also no limit on length of stay, so by all means settle in for the long-haul. In addition to the luxury of a flushing toilet (there’s an RV dump station here too), you’ve got on-site laundry and shower facilities -- two showers are included with each night of your stay; any more than that and it’s pay-as-you-go. Fishing Bridge is also the only campground anywhere in the park with full electrical hookups. And it’s pretty. Like in Madison, you can make group reservations here. This campground has the added perk of being near the Bridge Bay Marina, where you can check out boat tours or rent something yourself if you’re bold. All in all, one of the best options for the fishing and boating crowds. There’s a dump station, but no on-site showers or laundry. No worries, though, you’re just a couple of miles from Fishing Bridge. This is an especially woodsy campground, and also one of the most popular -- it helps that Canyon is itself the most centrally located area of the park. Like at Fishing Bridge, there’s a dump station, laundry, and showers (again, two showers per night are included in the rate). There’s also a nearby amphitheater, which hosts religious services on Sundays. This is the park’s southernmost campground, and it’s another one situated deep in the woods. Same deal with the dump station, laundry, and two showers per night. Along with Madison and Bay Bridge, Grant Village is the third campground to accommodate group reservations. There’s a campground amphitheater where rangers will host evening programs in the summer, and Grant Village itself has a visitor center and general store, so you’ll never need to trek far for basic supplies. For those of you who’ve never backcountry camped before, welcome to what is by far the most economically awesome way to stay in Yellowstone. Head into any of the backcountry offices around the park (you’ll usually find them near the visitor centers) and pick up a permit, which you can get up to two days in advance or right before you walk into the woods. You can check out the full set of regulations here and a complete trip planner here. In the high season, permits are $3 per night, per person, but max out at $15 no matter how many nights or people -- so a group of 10 still only pays $15 total each night. Advance reservations (meaning more than two nights ahead) are all $25 regardless of group size or other variables, but again, that’s just in the high season. From September 10 to Memorial Day weekend, backcountry camping is free (though you need to pick up the permit just the same). Late July through August is going to be the most novice-friendly time of year. If you’re into the idea of backcountry camping but don’t want to go it alone, there are overnight NPS-approved guided tours you can book, too. There’s a list of NPS-approved safety tips here, and you can quiz your friendly backcountry office ranger or volunteer on the finer points of camping in the wild. But, because we care, here are a few quick basics. Keep your food suspended off the ground and at least 100 yards away from your tent. There’ll be infrastructure for this, but you need your own rope. *Boil all your water, or, if you’re using a filter, make sure it protects against both parasites and bacteria. Tuck your pants into your socks so ticks can’t get in, or at least have to work harder at it. Campfires in designated fire pits only. Try to stay dry, but if you must cross a river, unbuckle your backpack straps so that it won’t drag you down if you slip. Always keep bear spray close at hand -- it’s no good buried in your backpack or anywhere else where it’ll take more than a second or two to reach. You will be beared by then. Yellowstone has a ton of what are known as Easy Access sites, meaning backcountry sites that are no more than 2 miles from the trailhead. The Canyon area holds a series of lakes that are fairly easy to hike to and from. Cascade Creek and Norris Meadows are both are excellent Easy Access options, and then to the west you’ve got (stay with me) Ice Lake North, East, and South. Ice Lake South is also wheelchair-accessible. Hellroaring is a collection of sites on the north side of the park, between Mammoth and Tower. You’ll want to be careful of a) the creek itself, which can be dangerous to cross until (usually) mid-August, and b) ticks. Hellroaring puts you alongside the absurdly scenic Yellowstone River, but if you’re really hard-up for a swim (and have a dry change of clothes) you should aim for the nearby Lava Creek Picnic Area. Lower Blacktail Creek, Rescue Creek, and Lava Creek are all top-shelf Easy Access campsites for backcountry novices. There are quite literally hundreds of backcountry campsites in Yellowstone, and those of you not burdened by inexperience or heightened fear of mortality have the full run of them. Maximum stay is usually between one and three nights at each campsite, but you can hop between them and stay out there for days and days if you know what you’re doing. This collection of 28 campsites, in the very most southeast corner of the park, is about as remote as you can get -- the Thorofare Trail alone spans more than 70 miles. Make your home the North Thorofare campsite (6T2 on your map) or the Rivers Edge Campsite (6C2). And now we come fully around to the other end of the spectrum from backcountry camping: glamping. Yellowstone and the Jackson Hole area have really leaned into the aspirational, frontier luxury vibe. Glamping is a fine option for visitors who want to partake in that rustic glamor and sleep in a bed, but still wake up with that crisp mountain air in their lungs. 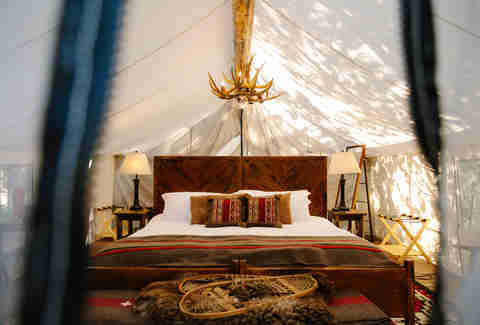 The insides of these tents look vaguely like they might belong to some sort of Rustic VIP section at Coachella, which I suppose is indeed the correct aesthetic for Yellowstone visitors who’d like to dabble in some sightseeing during the day but then also return to 1,500-thread-count sheets. This retreat opened in 2017 in Moonlight Basin, Montana -- a little over an hour from West Yellowstone -- which is great for people who want to explore the areas outside the park, too. Yellowstone Collective Retreat offers many of the activities you can do in Yellowstone National Park itself (horseback riding, fishing, kayaking) plus some you can’t (whitewater rafting; in-tent massages). Also, a resident chef will prepare you farm-to-table meals. Under Canvas is open Open Memorial Day weekend through Labor Day weekend. It offers all the usual activities, horseback riding and biking and fishing and such, but then also helicopter tours and a pretty impressive zip lining course. The grounds themselves hold super-amenities like volleyball and badminton courts, but don’t worry about losing sight of a more traditional Yellowstone experience -- one of this site’s greatest assets is that it sits just 10 minutes or so from the park.